Suhana’s grandmother was slowly forgetting the names of her grandchildren and recent happenings. At first, everyone thought that it is an age-related problem. But, when the test results showed Alzheimer’s disease, it left everyone in a state of shock. Yes, we all have heard about the diseases or incidents but we somehow feel that it cannot happen to us. 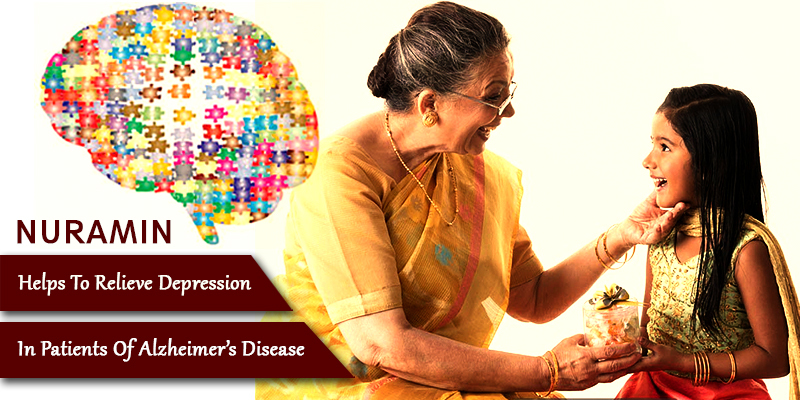 Alzheimer’s disease is one such disease which we keep reading about a lot these days. What is an Alzheimer’s Disease? Alzheimer’s disease is a progressive neurological disorder that destroys the memory and other vital mental functions. This loss is caused primarily due to the death of brain cells and is the most common form of dementia (a group of brain disorders that results in the loss of intellectual and social skills). Various medical studies have shown that the cause of Alzheimer’s disease could be a combination of environmental factors, genetic and lifestyle on the brain over a period of time. This disease slowly kills the neurons or brain cells and also decreases which leads to brain shrinkage. Plaques- The protein called beta-amyloid forms clumps in the brain that can damage the brain cells by causing a disruption on the cell-to-cell communication. A huge collection of beta-amyloids on the outside of brain cells is one of the main culprits of Alzheimer’s disease. Tangles– Another protein called tau helps in the transport of nutrients throughout the long extensions of the brain cells. In Alzheimer’s disease, the threads of tau proteins twist into abnormal tangles inside the brain cells. Thus, causing a failure in the transport system and death of brain cells. Family history and genetics- Scientists have found out that a person’s chances of getting Alzheimer’s disease increase if an immediate relative like a parent or a sibling has Alzheimer’s disease. The strongest risk gene is apolipoprotein e4. Age- As the age increases, the chances of getting Alzheimer’s also increases and the risk greatly increases after the age of 65. Researchers have also found out that the rate of dementia doubles after every decade after the age of 80. Gender- Women are more prone to developing Alzheimer’s disease than women. Lifestyle- Some of the lifestyle factors that can affect the development of Alzheimer’ s disease are high blood pressure, high blood cholesterol, lack of exercise, obesity, smoking, a diet devoid of fresh fruits and vegetables. Head trauma- Individuals who have had head trauma in any form in the past have a greater risk of Alzheimer’s. Let’s have a look at the symptoms of Alzheimer’s now. The initial symptoms include forgetfulness and mild confusion. Over a period of time, the person’s memory starts to fade off especially the recent ones. The ability to function at work and home starts declining. It may also cause the problem in thinking, reasoning, making judgments, decisions, planning and performing tasks. Some of the changes in the personality/ behavior are depression, wandering, changes in sleep pattern, mood swings, distrust, delusions, social withdrawal, and irritability. As they say’ Prevention is better than cure’, taking care of one’s health can help prevent the risk of Alzheimer’s disease later on in life. Bagdara Farms has come up with a product called Nuramin which is loaded with the strong, yet organic curcumin and turmerone which have great therapeutic properties. The aggregation of amyloid beta plaques is reduced by the anti-amyloidogenic properties of curcumin. It also prevents the aggregation of tau protein in Alzheimer’s disease. The anti-inflammatory property of curcumin and turmerone helps to decrease the inflammation in the brain, thus protecting it from degeneration of neurons. Curcumin has a neuroprotective property that protects the cells as well as cognitive function. The cognitive functions in elderly are protected by curcumin by enhancing the memory. Turmerone and curcumin are natural epigenetic agents which act as inhibitors of an enzyme that increases the chances of Alzheimer’s disease. Since curcumin has antidepressant property it helps to relieve depression in patients with Alzheimer’s disease. Take ½ tsp of Nuramin, a pinch of black pepper and boil it with a glass of water. Once boiled, add a dash of honey and consume it twice daily. ½ tsp Nuramin, 2 cups of water, ¼ tsp black pepper and 70 ml edible oil. Boil these together and make a paste. Store it in a jar and add ½ tsp of this paste to a cup of hot milk or tea and consume it once daily. Take ½ tsp of Nuramin, 1 tsp of raw honey and a pinch of black pepper. Boil 1 cup of milk with Nuramin and black pepper. Once boiled, add honey to it and drink this concoction twice a day. It is generally advised to start the dosages in small quantities and gradually increasing it over a period of time. 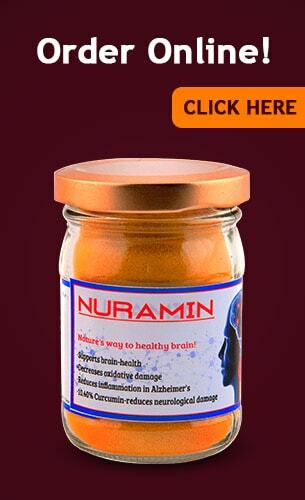 Buy a Bottle of Nuramin, to see its magical advantages. How to Get Rid of Pimples at Home? Is Your Dog Suffering from Irritable Bowel Syndrome?